Artist Lee Kohse brings you a fantastic giclee art print reminiscent of 80s family portraits! 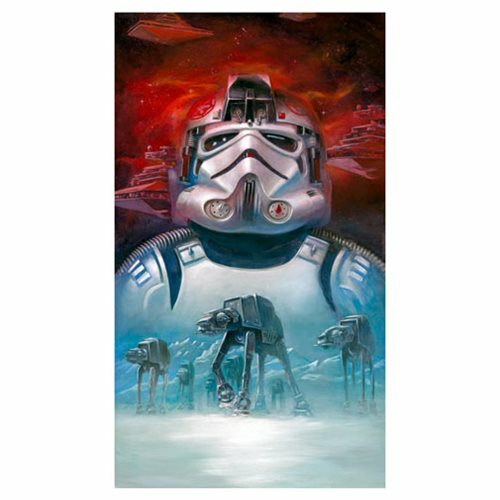 This Star Wars AT-AT Pilot by Lee Kohse Canvas Giclee Art Print features an AT-AT Driver / Pilot in the foreground with some Star Destroyers in red at the top of the background along with AT-AT Walkers in blue on the bottom of the background. A limited edition of 95 pieces hand-numbered and signed by the artist on canvas, this stunning giclee measures 24-inches tall x 12-inches wide!